The Rocky Mountain PBS station of Denver (KRMA-TV, Ch. 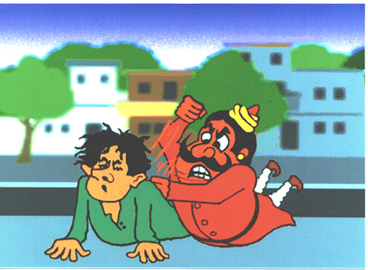 6), Colorado, USA has announced, the award-winning animation classics of Manick Sorcar will be telecast across Colorado at all their affiliate stations on January 1, 2013, the New Year's Day. The approximate 2 hours program will be shown early morning (6:00 am) on the New Year's Day which is the prime time for children's shows. 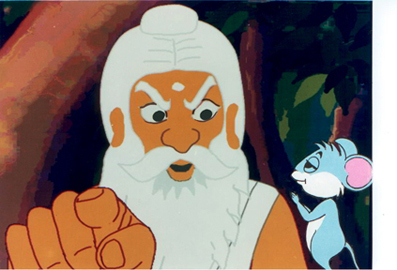 These will include 'Deepa and Rupa: A Fairy Tale From India', winner of the Gold Plaque at Chicago International Film Festival and Nominations for three Heatland Regional Emmy Awards; 'The Sage and the Mouse', Gold and Silver Medals at the International Film Festival of New York; 'Sniff (Gandhabichar)', Golden Eagle from the Council on International Nontheatrical Events (C.I.N.E. ); 'Rule of Twenty One (Ekushe Aine)', Bronze Plaque at the Columbus International Film Festival, Ohio, and 'The Woodcutter's Daughter', Finalist at the International New York Festivals. (Left) Sneezing without a ticket is a crime; the punishment is instant boom-boom-boom at the back in a scene from "The Rule of Twenty One". 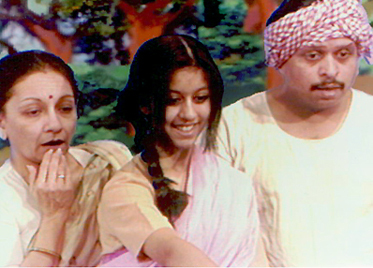 It is also based on a popular nonsense verse of satirist Sukumar Ray. 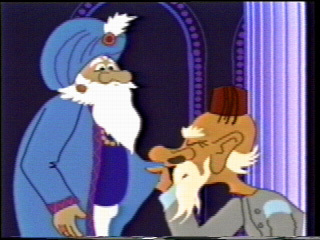 (Right) A scene from "The Sage and the Mouse", based on a popular fable from the Panchatantra. This will be the 24th year of telecast of Sorcar's animations in a row at the Rocky Mountain PBS stations of Colorado. 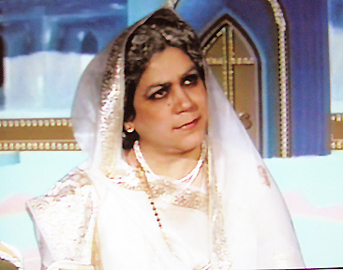 They can be seen at the following TV stations: KRMA-TV (PBS), Ch 6, Denver; KRMJ-TV CH. 18, Grand Junction; KTSC-TV CH.8, Pueblo; and KRMU-DT CH.20, Durango, Colorado, USA.